The key to sustained weight loss lies within an integrated approach that combines nutrition, self-help, fitness and wellness. As you begin to lose weight and make healthy lifestyle changes during your Optifast weight loss program new jersey, you will want to incorporate some healthy activities that also combine the above aspects of a healthy weight loss journey. Gardening not only helps you relax and relieve stress but also keeps you in shape. Gardening is the perfect physical activity to enhance your physical and mental health to keep you motivated and on track with your weight loss goals. Digging in the dirt has been known to relieve stress, improve your nutritional habits and help you burn excess calories. How does gardening relieve stress? According to a recent study in the Netherlands, when compared to other relaxing leisurely activities, gardening has greater potential to fight stress. For the study, two groups of participants were asked to either read a book or garden for 20 minutes after completing a stressful task. The group who dug in the dirt reported being in better moods and had lower levels of cortisol, a stress hormone, than the group who read. Your weight loss journey may be filled with bouts of emotion and anxiety as you work hard to sustain weight loss, but gardening can help you fight off stress while becoming one with Mother Nature. How does gardening help you lose weight? It may not involve heavy workout machines or equipment, but gardening is an excellent source of physical exercise that really gets the blood flowing. Gardening provides you with low-impact exercise as your body moves in many ways while you continuously weed, dig and plant under Florida’s warm sun. 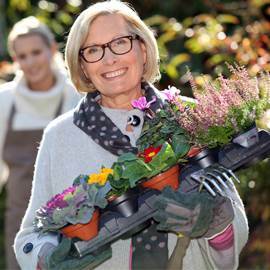 Unlike other rigorous physical activities, people are more likely to stick with gardening and do it on a regular basis. When gardening you aren’t focused on how many calories you’re burning or how rapid your heart rate is—your attention is focused on the task at hand as you work the earth and tend to your growing seeds. You are more able to enjoy what you’re doing as you don’t realize you’re even exercising. Here are some gardening activities and how many calories they can help you burn! For a 185 pound person, general gardening can burn up to 200 calories per half hour. For a 155 to 185 pound person, weeding a garden can burn 172 to 205 calories per half hour. Digging in your garden’s dirt can burn 150 to 222 calories per half hour. Spading dirt can also burn 150 to 222 calories per half hour. How does gardening improve your nutritional health? Homegrown fruits and vegetables are the freshest and healthiest foods you can eat for your weight loss diet. People who grow their own foods typically tend to eat healthier in general. More importantly, homegrown fruits and vegetables, if tended to properly, taste better than long-traveled grocery store produce. As you tend to your garden and watch it grow to produce fresh, delicious fruits and veggies you may feel more inclined to continue and enjoy eating healthily for a long time to come. Eating healthy foods from the earth can help you stay on track with your weight loss goals and live a healthier lifestyle. If you’re looking for a not-so-typical method of exercise and stress relief to add to your weight loss program this summer then try gardening. Gardening can help you relax and improve your mood, all the while burning more calories to help you stay in shape. For more creative workout ideas, don’t hesitate to ask your weight loss doctor.